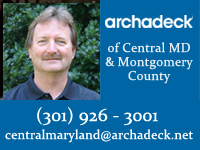 Rockville MD Screen Porch and Ipe Deck with Floating Benches – Stunning! 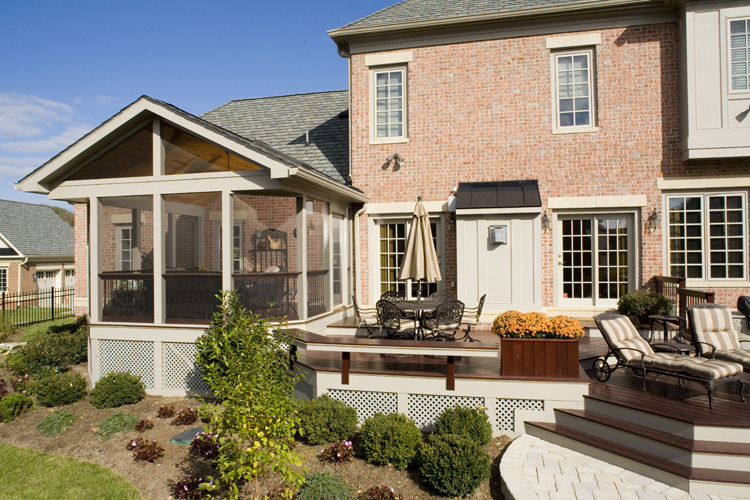 This beautiful and uniquely designed deck and screened in porch was a real design challenge that paid off big for these homeowners in Rockville, MD. These customers had a home under construction when they contacted us about adding the screened porch and deck to this new home. Their goal was to make sure it harmonized perfectly with the house itself. The challenge was in the size of the lot the home was built on. This particular lot was in a refined neighborhood which had small building lots. We met with the homeowner while the house was still in its construction phase. We wanted to design a structure that didn’t make the size of the lot even more constricting than it already was and maximize the feel of the living space. The elevation of the home was such that we decided to lower the main living area. 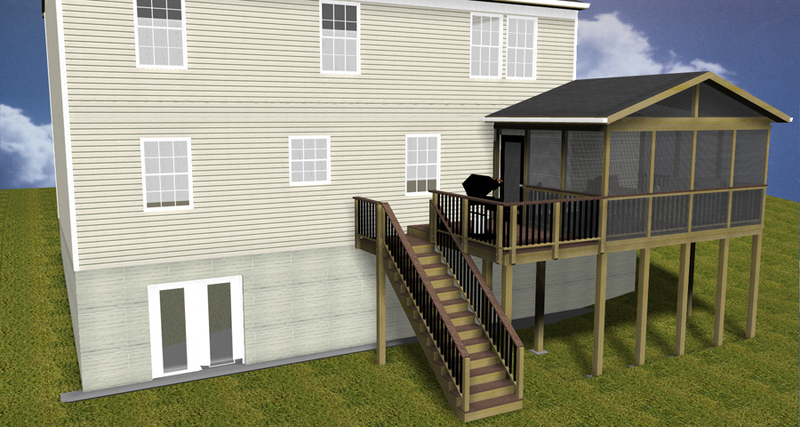 We also decided not to add railing into the design to open up the flow into the back yard. 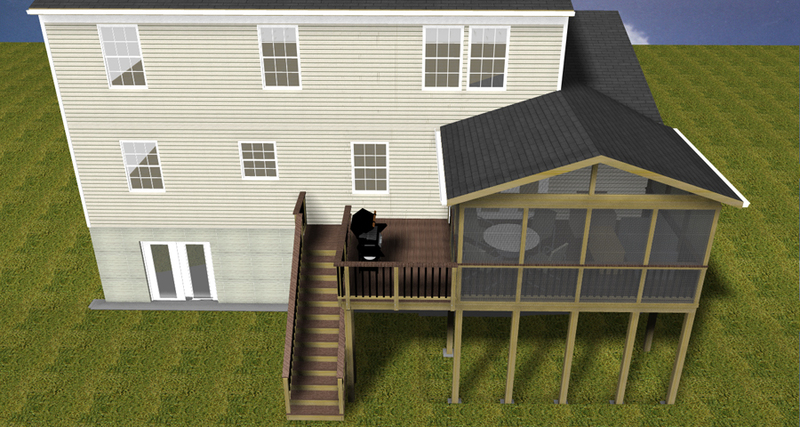 We used Cantilevers over the edge of the deck to pick up space beyond the edge of the deck. The bench was built as a floating bench. This allowed it to serve as a gentle barrier, maximize space, and maximize seating. In addition, the homeowners can also use this as a buffet during cookouts or family get-togethers or use it as a decorative area by placing potted plants or other decorative items on the bench. Another efficient use of the space was the gate under the porch which contains a storage area. We pride ourselves in creating designs that add character to our structures and add efficient usable space in places you least expect. For an elegant touch we used picture framing underneath the bench and also carried on that same elegance by using it under the screened porch. In order to maintain fluidity of the home’s details, we used the roof tiles on the screened porch to match the house. 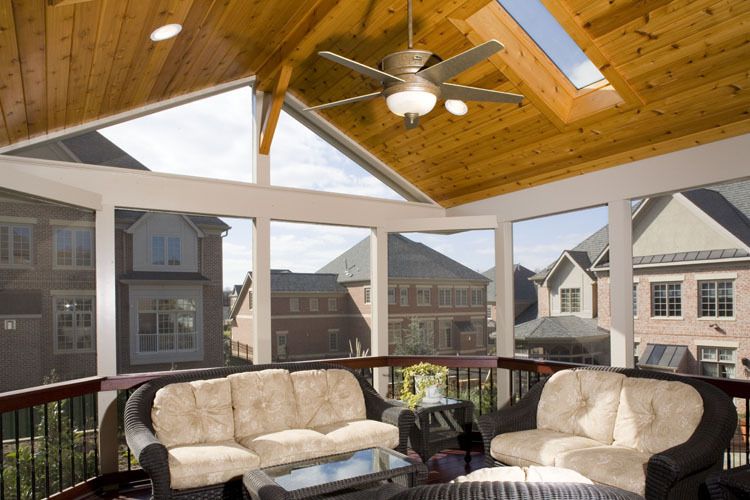 The homeowners’ intent was to use the screened porch to lounge and relax and wind down from the day. The details and beautiful touches make this screened porch a tranquil oasis. The door is an Anderson storm door which lets in full light and has screen on the door itself. The screened porch has a cathedral ceiling with gorgeous knotty pine. We installed Velux skylights on both sides of the screened porch and it has recessed can lighting throughout. The floor on the screened porch extends out to give color reveal. 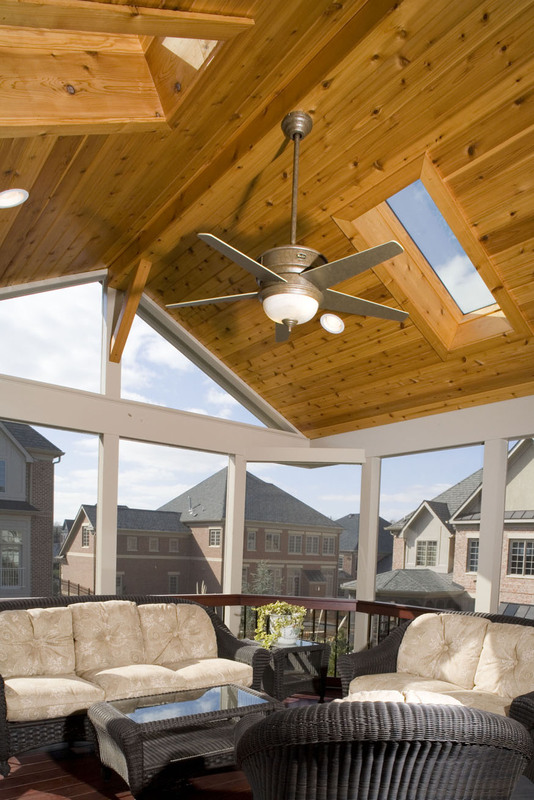 We even installed a ceiling fan on this screened porch that not only keeps you cool on those warm summer days, it is equipped with a heating element which will keep you warm on those chilly autumn nights. 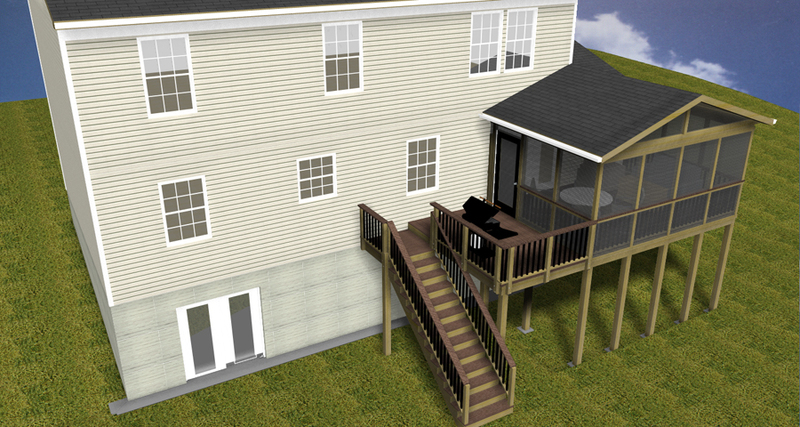 The addition of such a fixture will dramatically extend the time the homeowners can actually enjoy the screened porch. The beautiful design and details do not end when you leave the screened porch. The same careful attention was paid to every detail of the deck too. The octagon in the middle of the porch creates a unique focal point from a design element standpoint and also provides transition. All the decking material used was IPE. 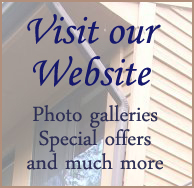 We used AZEK for all the exterior trim materials which is maintenance free and also matches the exterior of the house. 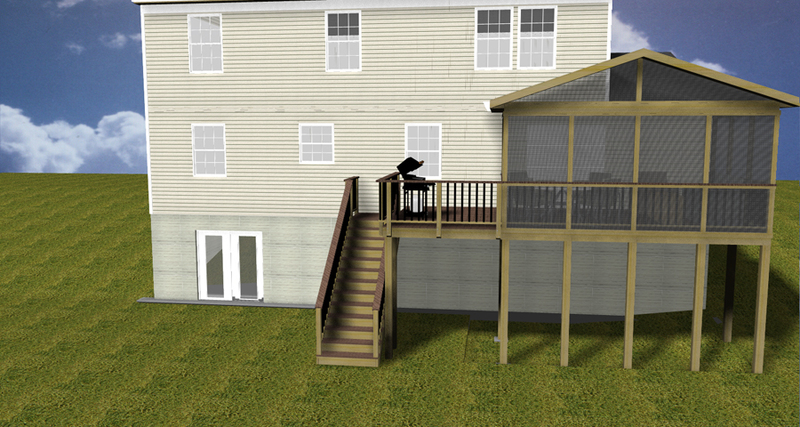 The deck balusters are Deckorator balusters and we used black-colored balusters to provide a more open look. Not only will this deck and screened porch give these homeowners years of enjoyment, it is so beautifully designed and built it is a true extension of their already beautiful new home. It has it all- character, craftsmanship, flowing design and beauty all in one place. 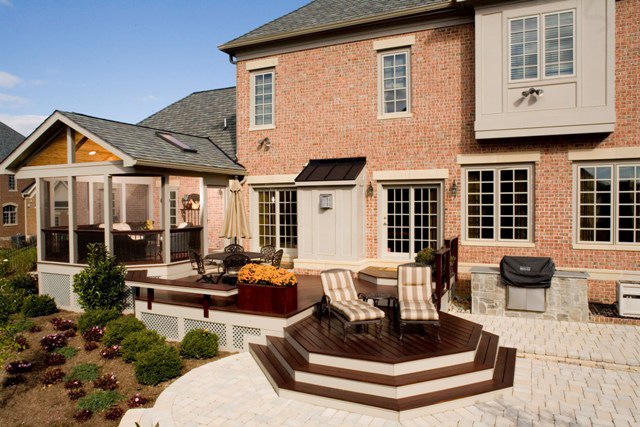 We can make your backyard a work of art too. We can plan, design and build you the structure of your dreams to enjoy for years to come. Give us a call today to begin your transformation.